I was flying through space when my rocket ship began to break apart. First the engine fell out. Then the radar dropped off. The wings cracked and fell away. And then the walls of the ship snapped off and flew out into space. 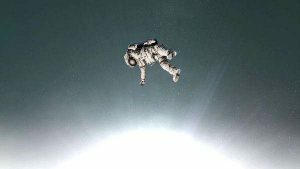 What was left was me sitting in my chair, in my spacesuit, floating in the nothingness of space. I didn’t really need the chair, so I unbuckled the seat belt, and the chair slowly separated from me. It was now just me, floating in space. I couldn’t tell if I was moving or still. I began to relax. I noticed the Milky Way. I was in awe of the bright colors of Jupiter.